WORLDWIDE: Are capacity payments essential for guaranteeing security of supply in a high renewables power system? Or is their promotion all about keeping legacy power plants solvent well past their sell by date? Achieving the perfect balance between maintaining enough electricity generating capacity to meet peak demand while not paying for a glut of idle power stations is notoriously difficult for any power system. Too much capacity adds unnecessary cost and too little risks blackouts. In developed countries, where power cuts can have economic consequences far greater than paying a little too much for a reliable supply, excess capacity has historically been an acceptable expense. That is no longer the case. Generators and suppliers in liberalised economies must dance to the disciplines of market efficiencies. Uneconomic generation is being pushed out and sometimes the production unit is retired before it has even paid for itself. "The bottom line is that our conventional thermal plants are going bust," says Ulrik Stridbaek, head of regulatory affairs at Dong Energy, a European utility and lead investor in offshore wind. Doing much of the pushing is wind and solar, whether in North America, Europe or Australia. Both technologies have low operating costs; they do not buy fuel and can bid energy into markets at lower prices than thermal plants. In countries like Germany, renewables generation is also granted priority access to the market. As a result, thermal generators tend to operate for fewer hours when in a strong wind market. Without enough sales of energy on wholesale markets, some power stations are being retired, removing chunks of capacity from the system. In the US that tends to be coal and in Europe it is coal and gas. The transition to renewable energy has coincided with a deep economic recession, falling demand and the collapse of the EU emissions trading system that would have provided a long term investment framework across Europe, says Stridbaek. Utility tales of financial woe flood in almost weekly. The sector talks about the "missing money" required to keep existing plant online and invest in new plant to maintain system reliability. German utility RWE, Europe's third largest generator, is vociferous about its shrinking profits. It is taking 3GW offline in Germany and the Netherlands and is assessing further units for retirement. "Due to the continuing boom in solar energy, many power stations throughout the sector and across Europe are no longer profitable," it said in a recent financial report. In Denmark, Dong and Vattenfall between them have reduced thermal capacity by 35%, removing 2.4GW since 2008. The growing renewables business of all three companies has apparently yet to equal the balance. In North America the story is similar, albeit with a lower penetration of renewables in most regions. The federal Energy Information Administration reports that wind is supplanting baseload generation across the entire Southwest Power Pool that takes in Kansas, Oklahoma and parts of New Mexico and Texas - all big wind states - as well as Arkansas, Louisiana, Missouri and Nebraska. The closure by 2020 of about 100GW of coal plant across Europe (49GW) and North America (53GW) in reaction to the rise of renewables and tighter emission controls is projected by Navigant Research. Retirement of excess capacity, particularly inefficient and polluting fossil fuel stations, is a positive result of policies aimed at phasing out dirty generation in favour of renewables. But if it happens faster than can be compensated for, power system operators would be faced with a potential gap in the required level of capacity to meet peak demand. While renewable energy displaces generation it can only replace 5-15% of the capacity on a power system without compromising security of supply - because it cannot be relied upon to provide needed electricity at any moment - unless other tools, such as compensating consumers to reduce demand when necessary are employed. Whether there is actually a risk anywhere of supply security due to lack of enough capacity, whether it has been caused by renewables and to what extent it might be a problem in future, is unknown, but it is being hotly discussed on both sides of the Atlantic Ocean. "We are watching the debate in this country over what really is the cause of customer outages or wide-scale power failures," says Mike Jacobs, energy expert with the Union of Concerned Scientists in the United States. "There is really no good assessment," of whether Europe risks a shortage of future capacity, says Paul Wilczek, regulatory affairs adviser at the European Wind Energy Association (EWEA). "There could be a problem, but how big is it?" The European Network of Transmission System Operators for Electricity (ENTSO-E) believes there is no problem in Europe. "Generation adequacy is expected to be maintained during the entire forecast period until 2020, even after the expected shutdown of German (and Swiss and Belgian) nuclear power plants," it says in its latest annual System Outlook & Adequacy Forecast. The Netherlands has the highest margin of "reliable capacity," operating 36% above peak demand, reports ENTSO-E. At the other end is Denmark where by 2020, when 50% of all electricity will come from wind, the margin turns slightly negative at 0.4%. Yet system operator Energinet.dk is unconcerned. With Denmark representing 1% of Europe's electricity supply, it can look elsewhere to fill the gaps. Divisional director Torben Glar Nielsen pointed out recently that Finland has relied for years on imports, with no supply issues. Indeed, Energinet.dk's CEO Peder Ostermark Andreasen said that if every country continues to maintain a typical 20% margin above peak demand, excess capacity across the continent will remain a perennial extra cost. From the Regulatory Assistance Project (RAP), a global group of past regulators offering energy policy advice, Mike Hogan says: "Prices in Europe are not low because we don't have a capacity market, they're low because we have too much capacity." The speed of change resulting from the rapid rise of renewables clearly caught a traditionally slow moving industry unawares. But the trend was well documented and utilities had the information to make different investment decisions points out Jerome Guillet of Green Giraffe Energy Bankers. "I thus have limited sympathy for their complaints about losing money in today's market - especially with new plants." Even so, governments and market regulators have taken utility cries of financial pain and warnings of possible supply interruptions - the "missing money" - at face value. Without proper analysis of whether a serious problem exists, the cause and effect and how to deal with it, mitigating legislation or regulations have and are being initiated. These range from new flat rate payments to generators for providing capacity, to competitive auctions for blocks of capacity in full scale "capacity markets" separate to wholesale markets for energy and grid support services. Scrape below the surface, however, and it becomes clear that making fundamental changes to generation and supply before proper analysis carries the grave risk of exacerbating the sector's ills. Remunerating generators for their capacity may not solve the problems and "generally results in protecting market incumbents' revenues", says EWEA. At best, capacity payments will prevent an orderly transition from fossil to renewable energy supply by introducing extra risk. That is the warning from several policy experts from bodies as diverse as major electricity association Eurelectric, EWEA and independent energy consultants for both fossil and renewables. At worst, it will destroy the balance of supply and demand on wholesale electricity markets and open the way for opportunistic speculation. "I won't say that capacity markets have become a national sport in the US, but they have been the subject of court challenges and political intrigue and billions and billions of revenue," says Jacobs. In August the PJM system operator in the US Northeast abandoned its plan for a long-term capacity market, fearing it would not deliver. "We have fought over these for more than a decade. Surely not a good sign," adds Jacobs. In Europe, where the concept of using separate markets to value capacity is new, the most radical step has come from the UK government. It has proposed a full-scale capacity market with auctions for future capacity, introducing a level of complexity that will pile more costs on the consumer and create more uncertainty to its Electricity Market Reform process. The proposal is far more than a mere market correction as the Department of Energy & Environment claims, says consultancy Timera Energy. "The capacity market involves a fundamental redesign of the UK electricity market that will impact the risk and return on all types of generation assets," it says. Almost without exception, policy advisers and government officials confuse two separate power system requirements in the debate of how to pay for the firm capacity needed to maintain system security. Power system reliability is about securing enough capacity to meet loss of load probability norms in the future, while system stability in day-to-day operation needs flexible capacity for continuous balancing of supply and demand (see The Seeds of Confusion, below left). Mixing up the two is largely the cause of the disagreement over whether a real problem exists and how to resolve it. It is too early to say whether a well designed market that makes it profitable for generators to provide ancillary services (short term reserves and grid support products) would also stimulate investment in future capacity, but experience in Ireland suggests it might. As the proportion of renewables increases, so does demand for ancillary services to ensure daily operational stability. If generators can make more money from selling ancillary services, the need for capacity payments to keep plants on line can be reduced, says EWEA. "A properly functioning energy and services market can deliver all the capacity you need," says RAP's Hogan. "An energy market is perfectly capable, at least in theory, of valuing reliability and compensating investors for supplying fixed resources. Too many people are using the current shortcomings in the implementation of wholesale markets as a pretext for claiming they can't work and to push for a return to central planning, though they rarely call it that." Australian energy writer Giles Parkinson makes a point also made by Hogan. "It's true that at times plenty of renewable power can depress spot prices. But, ultimately, dispatchable plant (usually fossil-fuelled) set the market prices. So they may run less but need to make their return over less energy production and hence increase spot prices, like we've seen in Queensland over summer and in South Australia more recently." The claim that there is missing money built into the design of the energy and services wholesale market is "erroneous" says Hogan. There is some agreement among policy experts that a well functioning wholesale electricity market should, in theory, dynamically value energy, support services and capacity in response to the changing forces of supply and demand. An ancillary services market that responds to scarcity of flexible reserves by pushing up their price makes it profitable to operate peaking plant that can rapidly ramp up and down, giving generators reason to keep plants on line and invest in future capacity. Well functioning markets, however, may be a pipedream. Market distortions everywhere weaken price signals. "Scarcity prices are reached only at some limited moments and the revenues generated by price spikes have generally not been enough to cover the fixed cost of peaking plants," says Eurelectric. Such price suppression would be avoided in a well structured market. Moreover, high prices would reduce consumer demand and use of costly peaking plants, but encourage more consumption when cheap renewables are available. "Distortions which hinder the balance of demand and supply must be removed," says Eurelectric. Such distortions can be far-reaching. In the US, one of the better tools for achieving day-to-day operational stability is to reward customers for using less or more power at any given time so that demand becomes responsive to system requirements. Commercial aggregators of this "demand response" product pay clients to reduce demand for short periods and sell this negative demand to the operator. But Jacobs points out that where rewards for provision of capacity are available, aggregators of demand response have been lured by higher prices to trade it as a capacity product rather than as flexibility on the wholesale market. Trading an ancillary service on a capacity market creates distortions: it removes demand response as a necessary price-setting component in the wholesale market, but provides justification for capacity payments that might otherwise not be needed. In Europe, political intervention to treat the symptoms rather than the cause of market failure is also endemic. Fragmented markets cause unwelcome price spikes, but instead of speeding market integration, governments introduce rules to control price volatility and end up neutralising essential market signals. To protect some forms of generation, they add priority dispatch rules, fuel subsidies and payment guarantees. Other distortions prevent unprofitable plant from going offline. It all hinders Europe's progress towards market integration for greater efficiency and lower costs. Dong's Stridbaek doubts the reality of a perfect wholesale market. So called energy markets sound good in theory, but in practice there are none in operation, he says. Australia comes closer than most, but all have caveats of one form or another. "After 15 years of thinking about this I've concluded that energy-only markets that could provide all the required services would just be too complex," Stridbaek says. But he does not advocate introducing capacity markets in Europe, despite the new challenges posed by renewables for system balancing. "The European market has not broken down yet. Now is not the time to redo the entire electricity market by introducing complex monsters," he says. It would only add to the "incredible uncertainty". Inconsistent legislation is a major cause of this uncertainty, as Eurelectric stresses. "Rather than focusing on creating a level playing field by removing market interventions that have outlived their usefulness, new distortions are added on top of existing ones," it states. EWEA agrees. In such a dysfunctional market, making specific payments for capacity, whatever the chosen mechanism, will not provide certainty for forward investments, it says. But they will cause market distortions: practice shows that capacity remuneration mechanisms remove investment incentives for cross-border grid infrastructure, demand-side response activity in the wholesale market and energy storage. They also impede cross-border electricity trade by reducing the peak-prices that make trade profitable. EWEA argues for an advance in power system planning to evaluate the entire integrated system's ability to deliver reliability through a full suite of services that includes generation, demand response, and more and better use of interconnection capacity. "Conventional generation capacity can no longer be considered as the only reliable source for adequacy," it says. The organisation points out that ENTSO-E forecasts annual adequacy entirely based on the reliably available capacity from thermal plant. By ignoring all else, including wind, it underestimates the capacity available to the grid to achieve reliability at least cost. While wind is a small number, it could make a difference, says Wilczek: "When capacity gaps are assessed, often enough these wind percentages already reflect the size of a possible capacity gap in future." Wind's capacity credit is also set to grow, says energy consultant Paul Gipe. Modern wind turbines designed for low wind sites have larger rotors relative to generator size and can deliver power closer to their rated capacity for longer. "This improves both their predictability of wind generation to grid operators while also providing the ability to deliver reserve generating capacity for emergencies, such as when a nuclear plant trips offline. And because the difference between average power and rated power is smaller, such wind turbines reduce the need for greater transmission capacity," says Gipe. For a variety of reasons less new transmission is likely to be required than many reports have projected, but speeding up development of cross border links is one policy that all agree would reduce the need to keep uneconomic plants on line. No longer would each national system require as much expensive-to-run capacity to cover occasional extremes of system stress. The cost of not building needed transmission will far exceed the cost of building one or two lines that are never fully utilised, argues Stridbaek. Eurelectric identifies grid bottlenecks within a country and insufficient cross-border transmission capacity as a scenario that may justify introducing a capacity remuneration mechanism (CRM) to potentially mitigate any risk of reduced reliability in future. Capacity payments may also be worth considering in countries without competitive markets where prices are not influenced by the ebbs and flows of demand, it adds. But each country must avoid national regulations that become a barrier to the overall goal of a pan-European integrated power system. To this end, in 2011 Eurelectric identified five models for paying for capacity, which range from a basic flat rate reward for all generators to a full scale competitive market model. The models vary in forward transparency, cost, complexity, ease of implementation and requirements for regulatory intervention, but all distort the overall electricity market, says Eurelectric. Payments for capacity blur price signals on wholesale markets, preventing scarcity of supply triggering the peak prices that would pay the cost of more generation and pay consumers to reduce demand. Capacity remuneration also risks double payments to the generator - for energy and for capacity, warns the association. Since 2011, Eurelectric has softened its cautious position slightly, noting that capacity payments have become a "de facto reality" in many EU member states. But it stresses that the better option is completion on time by 2014 of the long running Internal Electricity Market project. Its aim of integrating markets would go a long way to mitigate any potential capacity shortage by making it easier to remove regulated prices, price caps and other market distortions to "restore the market as a guarantee for generation adequacy". "CRMs are sometimes the only way of a quick fix for certain power systems," reports Julia Eichhorst, Eurelectric's senior communications adviser. The UK government appears to be alone in proposing a full scale capacity market as a major component of its Electricity Market Reform (EMR). The Department of Energy and Climate Change did however note, rather confusingly, that the market is temporary and to be terminated if not required, saying that this was unlikely for at least ten years. It looks to greater market liquidity, sophisticated demand side response trading and more interconnection to obviate need for a capacity market. One of the models identified by Eurelectric in 2011 is a tender for targeted resource (TTR), based on competitive bids that set the price for a resource that will only be called upon to cover the tip of peak demand within the outer edge of the margin of plant that ensures system reliability. That plant margin over and above peak demand is typically 20% of the reliable capacity. Winners of the tender provide electricity for just a few dozen hours a year to cover spot market deficits only. A concept similar to TTR is active in Sweden as an interim measure, to be phased out by 2020. In June Germany adopted another basic model as a temporary fix until 2017 while it assesses the need for a capacity market. Under its "reserve power station" regulation it requires 2.54GW now and an estimated 4.8GW for next winter, a small proportion of the system's estimated 100GW of thermal and hydro plants. The beauty of the German "strategic reserve" solution is threefold, says EWEA's Wilczek. As the most basic form of capacity mechanism it is procured completely outside the wholesale market. "It does not disturb the energy market model. Strategic reserve is simple and avoids too many externalities. The model also meets EWEA's demand for any CRM to be a temporary solution only." A fully fledged capacity market is far from temporary, Wilczek points out. Dong's Stridbaek believes the straightforward strategic reserve model is a pragmatic and easy solution to meet demand for the few hours a year of extreme system stress, with the cost passed through to consumers as a fixed charge. "It is elegant and not in the textbooks. It can be long term and it can be transitional. It can be designed so it does not undermine the real market." Danish system operator Energinet.dk has previously said that a capacity market would add in the region of EUR530 million a year to consumer bills if the country was to secure reliability within its own borders, compared with EUR60 million for a 600MW "peak load reserve" facility, according to EnergiWatch. "But the risk with a peak load reserve is that over time it can become just as expensive as a capacity market. A slippery slope can be created where the state has to pay to keep more and more power stations alive," says Energinet.dk CEO Ostermark Andreasen. Similarly, Eurelectric questions whether a strategic reserve would always provide sufficient adequacy and how different models would work across neighbouring countries. "Imagine, for instance, how a Dutch generator with no capacity reserve mechanism in the Netherlands would participate in the German strategic reserve? It would be very difficult to understand how it would work." If the Netherlands is running low and not Germany, how could a reserve intended for Germany be dispatched over the border, asks Eurelectric. So the big question remains: can a well functioning wholesale market for energy and ancillary services, including short term reserve, place a high enough value on conventional generation to stimulate investment in future capacity? It is an open question says Stridbaek. More design work on the details of the ancillary services market is needed, he adds. "It is time to think out of the box on flexible markets." Grid codes could be extended to cover how market participants behave, he suggests. Dong is firmly committed to competitive markets and the rule of market forces, although energy "of course has to be heavily regulated," says Stridbaek. But the focus should be on concentrating innovative forces on market design, he stresses. Even if an attempt was made to return to centrally run power systems, Stridbaek is confident that the complexity of the power system today makes a liberalised market the only way to secure supply at the lowest possible price. The time to think about a market for securing system adequacy, perhaps requiring a whole new market design, lies beyond 2030, says Wilczek. Much will depend on whether rewarding customers to reduce demand takes off in a big way. Even with more advanced demand management, Nicolas Wolff, president of the French wind energy association, sees a point when a wide geographical spread of wind turbines, more cross-border grid interconnection and increased use of hydro flexibility, may not be enough to secure reliability when wind reaches high penetration levels. Dependent on the capabilities of the flexible demand option, enough firm capacity must be available to cover peak demand for 1000-2000 hours each year, he says, or up to a quarter of the year. The best capacity for the job is cheap to build, even if it is relatively expensive to run, which is why open cycle gas turbines have traditionally been favoured. Combined cycle gas turbines are also used, but they need to be able sell output for 4,000-6,000 hours a year, or around 50% of the time, for investment to be profitable, says Wolff. He suggests the solution is to insist that required dispatchable capacity be mainly based on renewable generation, such as big and small hydro, biogas and biomass stations, which unlike gas can compete with wind at marginal cost and so can generate for more hours. A priority, says Wolff, is to focus on encouraging investment in this type of plant. 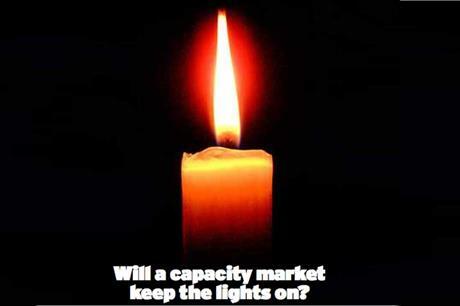 - What is a capacity market for? To prevent generating capacity that only supplies excess energy at high-prices being squeezed out of the wholesale electricity market in such quantities and at such speed that it may affect system reliability. - Why is this happening? Political intervention, including regulations for rapid growth of renewables, are hindering the wholesale energy market's ability to price electricity products correctly. - What is being done? Governments anxious about possible insufficient investment in capacity are proposing solutions that will further disturb the workings of the wholesale market. - How does this affect wind? Further uncertainty could scare off investment in the volume of firm capacity required on all power systems to ensure reliability. More wind on a system does not raise the required margin of firm capacity for reliability. Renewables need more system flexibility not more firm capacity. - Is there a shortage of capacity? Not in the foreseeable future in areas with increasing renewables in Europe, Australia or the US say system operators in charge of ensuring security of supply. - Why are capacity markets criticised? Their complexity adds costs and they risk permanently distorting the energy market, yet they may not be needed. - Where do capacity markets operate? They are common in the US but are a new and almost untried concept in Europe. - How big is the risk of unreliable supply? If wholesale markets stimulate continuous forward investment in sufficient flexible capacity for operational stability, future reliability should be secured. - Do reliability criteria limit wind? No, say experienced system operators. An economic limit at more than 50% wind may exist, dependent on the cost of alternatives. Wind displaces generation, not much capacity, but that is no barrier to high wind penetration. - What about covering for peak demand? Only a small volume of generating capacity is called upon for short periods to meet peak demand, also in a power system with high renewables penetration. - So where is the problem? Energy policy uncertainty inhibits investment in required power generation capacity for the future, not the rise of renewable energy. Payments for capacity are for forward procurement of enough megawatts of generation to meet future demand reliability, known in the industry as "generation adequacy". Determining the volume of capacity required in three years' time (the time it takes to plan and build a gas power station) and offering sufficient reward to stimulate investment now without wasting money in future should, theoretically, be achievable through the forces of supply and demand in a well functioning wholesale market for energy and its ancillary services. Flexibility is achieved separately using ancillary service markets, which procure short-term reserve generation and grid support products for everyday system stability. Ancillary services are traded in months, weeks, days and hours, not years like capacity. Ancillary service markets are for securing the right combination of resources for "generation quality" not "generation adequacy." Ancillary services are adapting well to supporting high penetrations of wind energy. Competitive trading of these services is part of some, but not all, wholesale electricity markets. Despite the different roles for capacity markets and ancillary service markets, nearly all policy documents at some point confuse the two. Eurelectric's report on the topic - RES Integration and Marked Design: are capacity remuneration mechanisms needed to ensure generation adequacy? - adds a third confusion factor. It argues that the expanded role of ancillary services to accommodate wind "creates a third dimension of generation adequacy", yet in the same sentence it identifies the expanded role of part loaded plant as one of flexibility, so clearly an ancillary service. Similarly, in the US, the California Independent System Operator, in arguing for "a three to five-year forward procurement mechanism", refers to making payments to secure sufficient capacity as part of the same process as securing the right mix of capacity for flexible load-following. Such muddling of the issues contributes to political paralysis everywhere on making long overdue decisions on improved energy market design, says Mike Jacobs, energy expert with the Union of Concerned Scientists in the US. "There's no consensus here amongst the principal parties, so we can only assume policy makers are not clear." Creating a new system of benefits, or an entire new market, to stimulate investment in enough future capacity without interfering with the ancillary market's valuation and procurement of reserve capacity is a tall order for any legislator. Securing sufficient flexibility in the system is a separate issue to stimulating investment in future capacity. In the US, the three power system operators in the eastern states run arguably the most advanced centralised capacity markets in the world. They aim to procure enough capacity to meet the planning reserve margin "at just and reasonable rates". PJM Interconnection, ISO New England and the New York Independent System Operator rely on the crossover point between a supply and a demand curve to set the market price, just as in any market. The demand curve is an administratively calculated approximation of customer need plus a margin over and above the capacity needed to meet peak demand. The supply curve is based on actual offers from power suppliers. Shaping the curves to achieve long-term capacity adequacy at "just and reasonable rates" is complex. Market prices must avoid distortions caused by the "cost of new entry" (CONE), currently a particular focus of discussion in energy market reform in the UK. Capacity costs must be net of CONE for a market to provide the right price signals and CONE is yet another administratively decided value (thus open to human error) with considerable influence on market prices. Variable supply from renewables is one of the complications to consider, but not the most challenging. Capacity has to be available at the right time in the right place to avoid transmission constraints. And the greater reliance on gas and its "just in time fuel delivery" is a new challenge for system reliability. The timing of capacity auctions is also crucial; short term auctions do not offer attractive investment horizons; long term auctions risk investment stranded in worthless assets, or consumers having paid in advance for production not required.